We were saddened to learn of the avalanche hit 50 Sherpas working on Mt. 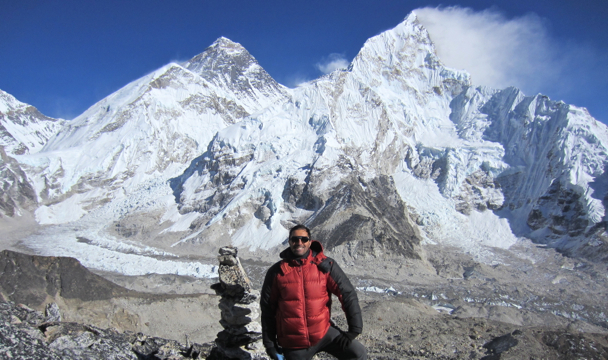 Everest on April 18, killing thirteen and injuring others. We join people around the world in sharing a sense of loss and in extending our sympathies to the Sherpa community. Thankfully, our friend Francesco Rovetta was not in the area of the avalanche and is fine. However, the climbing season on Mt. Everest has been cancelled, so Francesco will not be able to continue on with his expedition to benefit Nepal Youth Foundation. We so appreciate Francesco’s efforts on behalf of the children of Nepal, and we’re so grateful that he and his team are safe. Our original article published on March 30 about Francesco’s expedition follows below. Francesco Rovetta will climb earth’s highest mountain next month to raise money for our New Life Center in Kathmandu, Nepal. The avid mountain climber took a break from his day job to create Summit Stories, a multi-year project that will take him to the top of seven of the world’s highest peaks to raise funds for some of the world’s neediest children. At 29,029 feet, Mt. Everest will be the most challenging ascent in Francesco’s Summit Stories quest. Francesco has also challenged himself to raise funds for our New Life Center — a healing place for HIV/AIDS affected children and their mothers. The New Life Center takes a holistic approach to the treatment of these fragile children — providing nutritious meals, life-prolonging medical treatment, psychological counseling, and tutoring. Children and their caregivers stay an average of three months before returning home fully nourished and free of secondary infections. The center served 88 children last year, and 65 of them were discharged upon improvement. Currently housed in a rented house in Kathmandu, we hope to expand the clinic to serve more impoverished children and their mothers. The funds raised by Francesco’s expedition will help make this dream come true. Francesco will travel to Mt. Everest with seven climbers and an array of guides, Sherpas and porters. The climb up the mountain known as Sagarmatha in Nepal („the Head in the Great Blue Sky“) and Chomolungma in Tibet (“Holy Mother”) will take about two months. Francesco will climb to the summit in late May. Many thanks to Francesco and to all the supporters of Summit Stories for caring about the children of Nepal! Read more about Francesco’s quest at Summit Stories. Learn about NYF’s New Life Center.